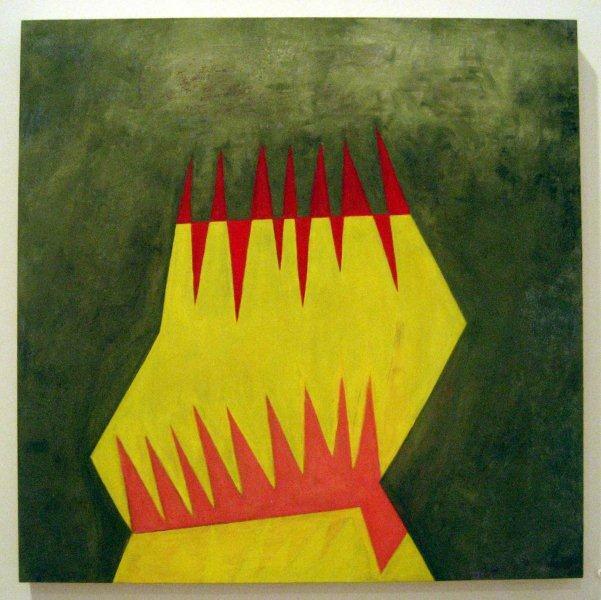 We're at the penultimate post in this series with work by Fran Shalom, Debra Ramsay and Martha Clippinger. 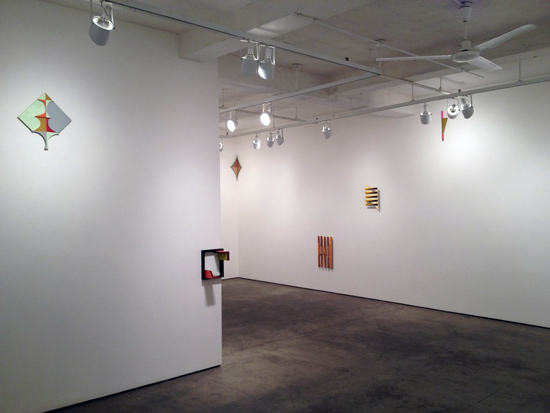 Their solo exhibitions took place in New York City in late winter and throughout the spring. All three artists share color as an integral element expressed via a kind of organic geometry. Ramsay and Clippinger express their esthetic by material means--encaustic and wood, respectively. 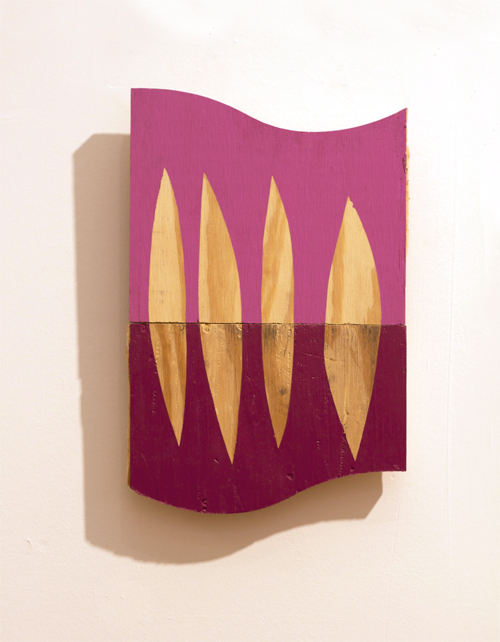 Clippinger is the sculptor of the group, repurposing what appear to be lumberyard castoffs, though you could make a case for the work as painting. 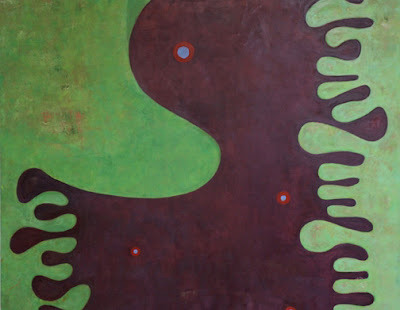 Formal and quirky, Fran Shalom's paintings are typically small to easel size with a glorious sense of color. 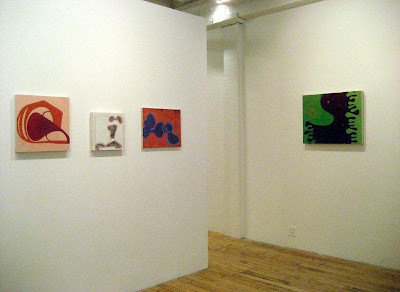 Shalom employs a personal language that embodies geometric and biomorphic shapes for the telling, dipping into a visual Esperanto shared by painters like Andrew Masullo, Stephen Mueller and Thomas Nozkowski. Shalom's next solo is at John Davis Gallery in Hudson, October 11 - November 4. You can read an interview with her on the Lisa Pressman Art Blog. .. . . . . . . . . . . . . . In landscape architecture, "desire lines" are the intuitively effective paths created by people walking from one point to another, ignoring the architecturally imposed placement of concrete walkways. 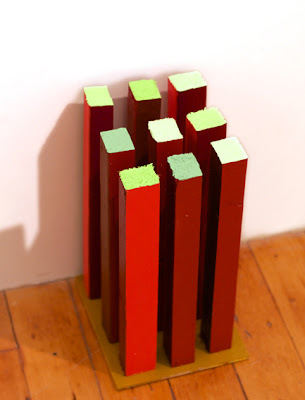 In Desire Lines, we see the intuitively effective path Debra Ramsay has taken in her practice. 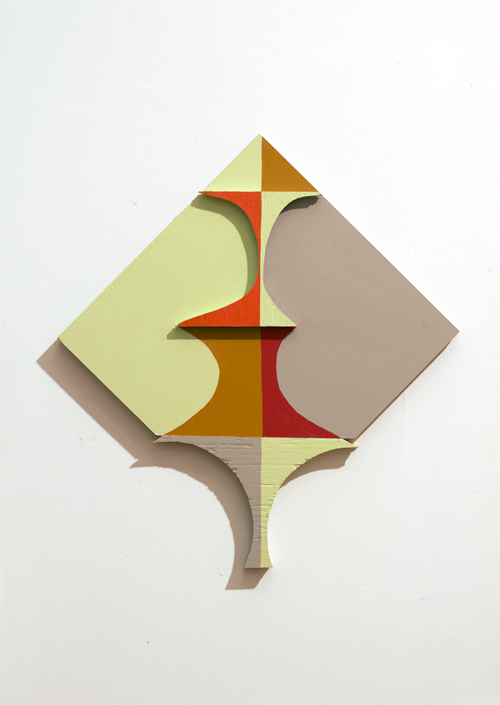 Working with the materiality of encaustic paint, Ramsay operates within predetermined systems that she has set for herself--spatial divisions or, here in the work shown, fixed divisions of time--and then allows chance to affect the outcome. In the works you see here, she has poured the molten paint from a fixed point, allowing the paint to find its intuitive path, guided by gravity, the cooling of the paint, and the angle at which the artist holds the painting. 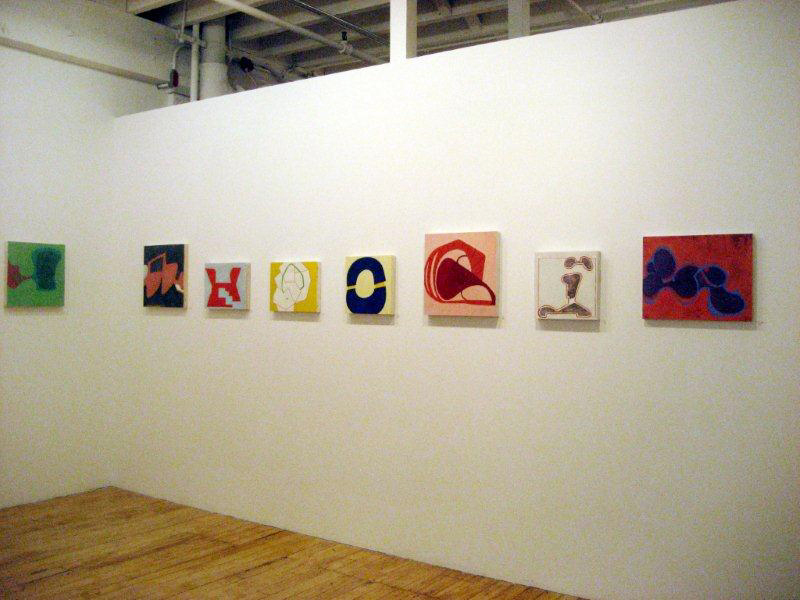 Installation view from the entry, showing Cruel Desire. 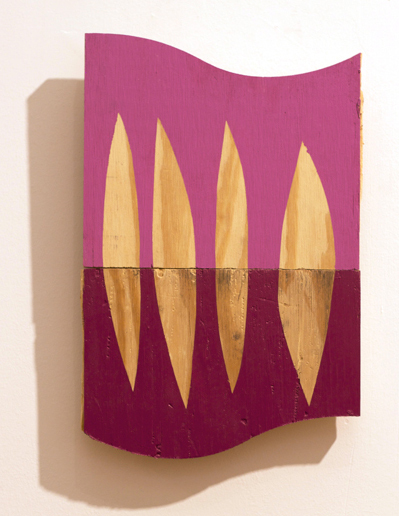 Martha Clippinger's small painted sculptures, constructed from irregular wood scraps, are funky and imperfect. I mean that in the most positive way, for while the edges may be unfinished each idea is complete. 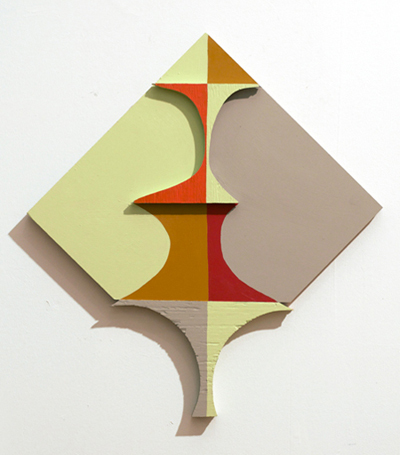 There's a geometric sense of order that rubs up against an anarchic sensibility. I like that. 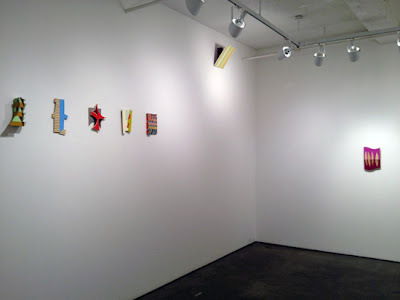 You can see a connection to the work of Richard Tuttle, of course, but these works have their own presence, playful yet pushy. 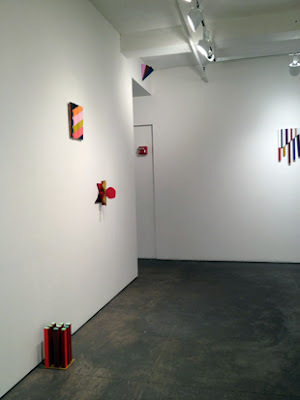 An inspired installation placed the pieces on the floor, at eye level, in corners, even high overhead on the wall, offering an engagement with the work--part sculpture, part painting--that complemented its eccentric character. Please consider a voluntary annual donation of $20 to support this blog. If you scroll down the sidebar from the top, you'll find a Paypal link. Thank you. And big, big thanks to all the readers who have done so already! I'm honored to be included in your post. 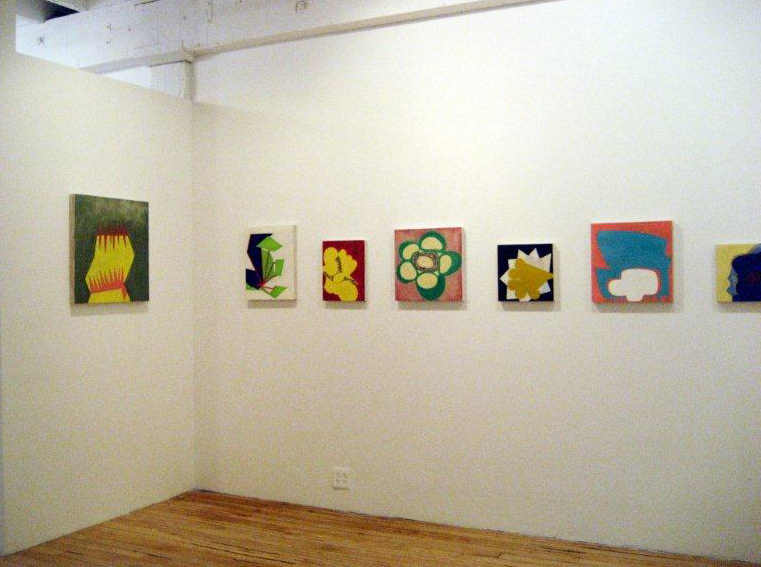 The gallery gave you misinformation on some of the paintings. The piece labeled "Gratitude for Agnes Martin" is actually "First Breath". "Add Days" is actually "Odd Days"
Thanks again for mentioning the show. Different and compelling work! Thanks for posting this, Joanne. I saw Debra's work in New York and wrote about it in my blog. Congratulations to all three artists on making such colorful and unusual pieces. I enjoyed Fran's last show immensly! Love all the work here! This entire posting was great. I enjoyed all three artists' work.